My daughter wanted to "jazz" up the colors. sans the coloring and fragrance. until it looks, smells and feels how you would like it. You (and your daughter) are nothing short of brilliant! Love this happy, practical, delightful gift! I don't know which I like better...the all white...or the beautiful colors together...lovely! LOVE THIS! The colors just make you want to use it!! LOL!! I have been looking for a few scrub recipes and I am definetely using this one :) Thanks! These are fabulous! Thanks for sharing! These are really cute :) I wonder, have you tried using the really colorful ones? I just wonder if the color would stain your skin? How do you keep the colors from staining? Do you mean staining your skin? It doesn't! How long can you store the scrub before it goes bad? I have never had a problem with it "going bad"
This is a great idea! What size jars did you use? I have a birthday party to attend this weekend, and this would be a great gift! Love these. I think I've just found my stocking stuffers for my friends this year! Thank you very much! you add all the ingredients together and mix, no need to dry anything out. The scrub is not really dry, it is similar the consistency of damp sand. I just made this coconut sugar scrub: http://www.jacolynmurphy.com/2012/08/scrubbing-up-some-bridal-shower-party.html that I like even better! Alexis, How did you make the little "swizzle stick" that is on the jar with the plain sugar? Is it simply coated with the scrub and dried out? Does it hold up pretty well...as I love the way this looks! I should have said something about that! It is a rock candy sugar stick that I bought. It is just for fun to eat, not to use in the scrub! I've had salt scrubs but never sugar scrubs. Is it not horribly sticky? Do you just use granulated sugar? And when you make it do you just mix it up in a bowl and then place in the jars? Have you ever used baby oil instead of the olive oil? I don't care for the smell of olive oil and was just wondering if baby oil would be a good sub. I'm thinking the lavender baby oil would smell wonderful. Yes, as you can see in the original recipe I used baby oil but I switched it to light olive oil (which doesn't have much of a scent) because I thought the baby oil smell was too over powering. Lavender would be great...I would try it, you can't go wrong! Does the neon coloring run or color your skin or shower? I did exactly as you and I used the neon colors... blue, green and purple and it immedietly turned my hand blue!!! It is still blue.. Did I do something wrong? Don't see that I did! It looks just like yours! Any tips?? Do the bright colors stain your skin? Yay!! I'm making this for Christmas! With your updated recipe, do you still use the corn syrup? I have made 8 already! I used this recipe before, but never thought of using the food dye. Can't wait to give them to my football moms! Thanks! Alexis - you have just stretched my Christmas budget. Thanks! I can't wait to try this. This is a great idea except for the cake icing coloring, that's what I buy my daughter when she wants colored streaks in her hair and it lasts a long time. All in all though I can't wait to try this. Wouldn't the corn syrup make is sticky? What is the actual purpose of corn syrup? I found this on Pinterest and I LOVE IT! Thanks!!! 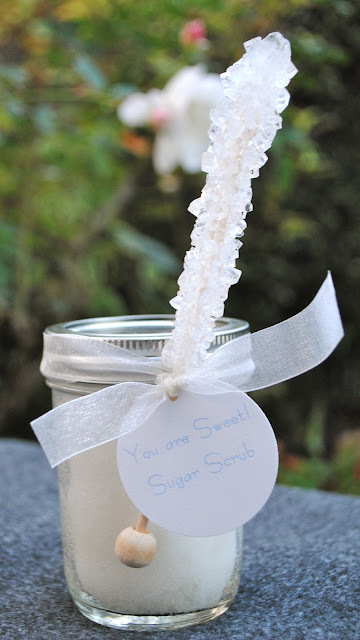 I made a sugar scrub in the past and it was YUCKY! Looking forward to trying this. There is a revised recipe at the bottom of the post! I made the peppermint scrub using olive oil and it turned the color a light yellow? what kind of oil can i use to not make this happen? I too am also having the same problem with the white being a yellowish color and I actually used "extra light" virgin olive oil thinking that would work better then just the "light" oil and its still yellowish. To my understanding isn't the "light" or "extra light" referring to the taste of the oil and not the color? I buy the least expensive light olive oil at the supermarket I am sure they all vary in color but I haven't had any issues...just add more sugar until it is whiter or any oil will work. Ok nevermind the problem was like what you mentioned in your earlier post.......add more sugar. Omg this is so cute and a total budget saver for Christmas. I home school so this is a perfect arts n crafts time for my daughter and me. Thank You! What are the directions to use the scrub? Do you put it on a wash cloth, and how much so I can add instructions with it as a gift! Please. First time making this and don't usually use scrubs. You can put it on a washcloth or scoop a little out and lightly rub directly on skin. Did you ever have a problem with the colors running together eventually? I wanted to make the red/white peppermint stripes but I heard of another girl (slightly different recipe)that the stripes started to run together after about a week or so... My guess is because when you start using the scrub then the colors will mix but I didn't ask her. No I didn't have a problem with the colors running. I packed the scrub in the jar in tight layers. Do you mix oils and extract with ALL the sugar and then color half? I love this recipe and I want to try it out for a Christmas craft show I'm doing in a few weeks. I was thinking of using half-pint jars. What would you recommend for pricing? I made the candy cane sugar scrub and the red turned my hands red. Is there a specific food coloring I should use? as I said above, mine colored the skin slightly but came right off with soap and water. Yes, I melt the Coconut Oil. Let me know how it goes with the Koolaid...GREAT idea! how long does this scrub last? i would like to know so it doesn't go bad before i give it as gifts for Christmas. thanks! Love the colors by the way! What department. Food? Bath and body? How long does it last after it is made? Can you substitute something else for the coconut oil? Like to make one for myself as well as my female family members, but I'm allergic to coconut!!! Yes! any oil is fine! 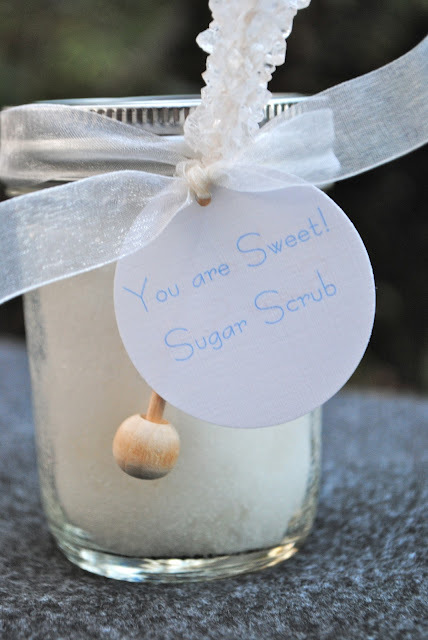 what is the scrub for your face? How did you pack it in the jars?? I love this idea! 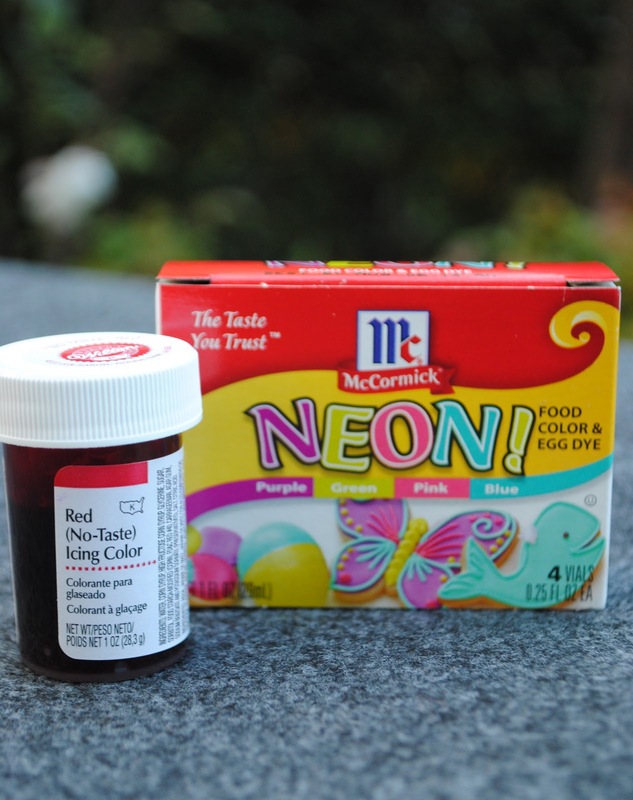 I have sensitive skin so I will probably not add the food coloring. Has anyone had issues with the flavorings irritating skin? Thanks for a great idea!! Could you use the coconut oil in place of the other oil as well? Or do you think it would overpower the peppermint oil scent? You can use a little but it does alter the smell...give it a try! Love this! Where do you reccomend buying your jars? Thanks so much! They have them at most grocery stores, Target, Walmart, etc. I was thinking of using the restraunt (spelling?) style pourable sugar dispensers...they are only a dollar at the local Dollar Paradise store. To pack the sugar down, I have some of the old, tiny Tupperware savers that would fit down into the sugar jar and use the saver bottom to pack down the mixture. The mixture should be able to pour out of the sugar dispenser spout without clogging, shouldn't it? Going to make these as Christmas gifts for my friends and family. Being a single mom, money is tight and this is perfect for all my girls that is affordable and awesome. Thank you very much for sharing this! Not wanting to sound greedy.....but do you by any chance have a printable for the tag you would make available? I am NOT gifted in that area at all!!! Email me I have no way to contact you! Sorry, I don't have it in printable form! Hi Alexis - what size jar did you use?? I absolutely LOVE this and I am SO thankful you posted this! I am on a budget for sure and have been looking for the perfect budget friendly yet cute gift to give my fellow teachers! this is so cute I will give it to friends also if it works out for me! My only question is about the oil. I have vegetable oil I can use in place of coconut so I would use 1/3 c LIGHT olive oil and 1/8 c of vegetable oil? I guess my question is do I need to make sure to have 2 different oils or would just vegetable oil alone work? Thanks so much! any combo of the oils will work, just experiment and see what you like! What are there scrub for? They are body scrubs to exfoliate your skin! Hi, I found this through Pinterest and would like to make it for my sis-in-laws for Christmas. Maybe it's just me but I'm confused as to how to put the jar together. Do you mix the oil, sugar, food coloring and flavoring to each "layer" or who do you assemble it? I'll admit to being craft-challenged. 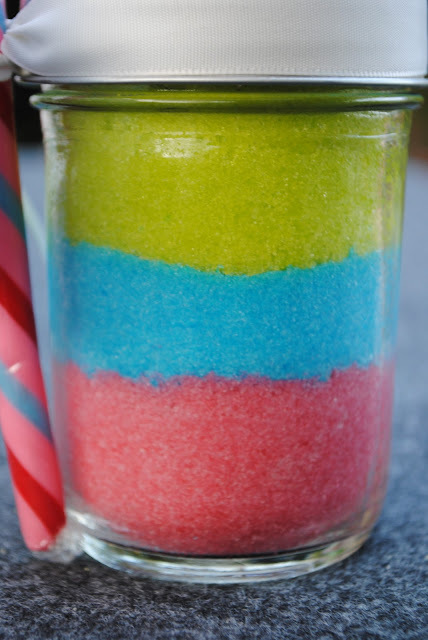 Sorry for the confusion...I make one batch of each color, then layer them in the jar. I pack in tight on color (just with a spoon) then the next layer until it is filled. Let me know if that doesn't make sense. 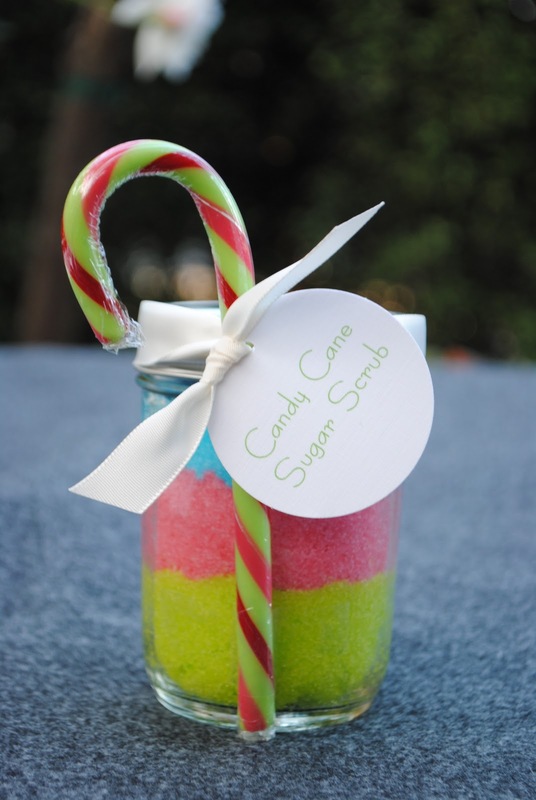 So, you mix the sugar with food coloring, peppermint & oil for each layer? Was just wondering if you could put anything in this to make a candy cane kind of smell? could you use vanilla extract instead of peppermint, or would the coconut oil overpower that? I think vanilla would be great! could i use vanilla and no coconut, and still have it smell like vanilla? Try it Patricia...fun and easy! would oil only and vanilla still smell like vanilla? It should...give it a try! is that a mason jar? my only concern with these jars is that the center piece of the jar is seperate right? seems like it would be impractical while showering to deal with a 2 piece lid? any suggestions? LOVE this DIY. Thank you so much for sharing. Pinning away.. I love how cute the candy cane sugar scrub is. I want to make these for all the ladies in my book club. I am somewhat dubious about the red food coloring making your skin red. Any suggestions that will really help to make this less of a problem??? So a great idea. (there are 15 ladies in my bookclub so coming up with an inexpensive give is a challenge) Thanks!!! It barely tints the skin and once the white and red layers are mixed when they start using it, it is even less. You do not need to use much coloring at all, even if it is a lighter red than I did it is still really pretty in the jar. You could also make the red layers very thin. I'm planning on making a few of these to gift to friends and family this Christmas as a little something extra. Do you mix in all of the ingredients all at once? Is there any special order or procedure when mixing? This is amazing. I love the simplicity of it. Thanks for sharing the tutorial.